Dr. Eugene Gu. He is — was — a surgical resident at Vanderbilt University. His resume exemplifies academic perfection: valedictorian in high school, undergraduate degree from Stanford, medical degree from Duke, surgical residency at Vanderbilt. He also founded his own research company. Not once throughout the span of his academic or professional career would one have any reason question his capability or competency. But several weeks ago Vanderbilt fired him, citing “performance” issues. Because Eugene is an outspoken advocate for social equity. And there seems to be no place for that in the authoritarian, monotonous, uninspiring world of medicine. Physicians should be leaders in public discourse and public health. It is our duty to advocate for policies and support the people who improve our nation’s health; and to criticize policies and condemn the people who harm our nation’s health. That is the role Eugene accepted, and he was punished for it. He spoke up against racism and sexism and various other prejudices — constructs which have been shown repeatedly to harm the health of those who experience them. He publicly condemned Donald Trump. He fought for his right to conduct lifesaving research. However, the fear-based, hierarchical world of medicine did not praise or promote him for his efforts — they fired him. The message reverberated to all of us in health care who care about changing the status quo: Either get in line or get out. Eugene’s behavior is not inherently problematic. It stands out because in a strict culture where conformity was mandated of him, he refused. When he was in hot water with his research, we spoke about his unwillingness to conform and the pressures imposed upon him. 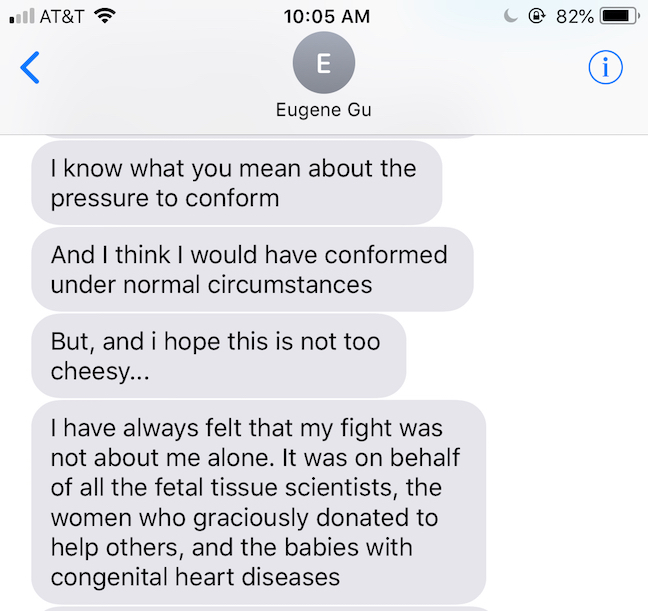 A conversation I had with Eugene when his research was being threatened. His behavior is not antagonistic, it’s heroic. He doesn’t battle states or institutions or presidents for attention, as his detractors would say; he battles them because he stands for what he believes in. He has values. He has a moral compass and is courageous enough to advocate for what he thinks is right and to condemn what he thinks is wrong. We shouldn’t be scared to associate with Eugene. Rather, we should learn from him. We should promote him, be inspired by him, and become an spokesperson for what we believe in — just like he has done. By firing him, the culture of medicine let us down. It reinforces the notion that if we are to advocate for what we believe in, we will be punished and ostracized; and if we conform, we will be rewarded. But conformity to a healthcare system that produces high rates of suicide, depression, substance abuse, anxiety, and disillusion among physicians is illogical and unsafe. Refusing to conform, insisting on maintaining our identities, and standing up for what we believe in — behaviors Eugene has demonstrated — are ways we will transform the culture of medicine. I appreciate you, Eugene. On behalf of those in medicine who want to overhaul the status quo, thank you. Jamie Katuna is a medical student. She can be reached at her self-titled site, Jamie Katuna, and on Facebook.